How much does it cost to travel to Byron Bay? How much money will you need in Byron Bay? AU$165 ($118) is the average daily price for traveling in Byron Bay. The average price of food for one day is AU$66 ($47). The average price of a hotel for a couple is AU$143 ($102). Additional pricing is in the table below. These average travel prices have been collected from other travelers to help you plan your own travel budget. How expensive is Byron Bay? How much money do I need for Byron Bay? South of Brisbane, off the Pacific Highway, is the coastal town of Byron Bay. It is close to Cape Byron, which is the easternmost point in mainland Australia. 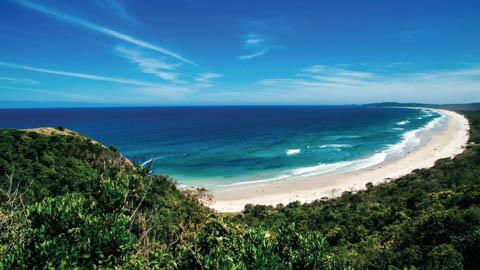 Byron Bay makes its way onto most traveler's itineraries because of its wonderful beach activities. The area is world famous for its waves, making it popular with surfers, but it also has incredible scuba diving, whale watching, and a generally relaxed atmosphere. The area continues to rise in popularity with travelers and as such, amenities and facilities are popping up everywhere. The town itself has an eclectic vibe and many of the local residents make their living as artists, writers, or alternative and holistic healers. You may find yourself surprisingly drawn to the area, and don't be surprised if you end up lingering longer than you originally intended. You won't be the first. Byron Bay's climate is mild and temperate. The summers are warm and the winters are mild. Winter maximum temperatures are usually around 19.4 degrees Celsius while the minimum temperature is around 11 degrees Celsius. Summers can climb to around 27 degrees Celsius and the evenings are damp and cooler. Most people come to Byron Bay for the beaches and the water sports. The best beaches are Byron Main, Watego's Beach, and Tallow's Beach. Bryon Main is the most popular. It has smaller waves that break close to shore. Watego's Beach is popular with the longboarder crowd. Tallow's Beach is less popular. The surf is larger and tourists rarely visit this beach, in part because it is harder to find. Byron Light House is a walk from town. There's a path that leads to the light house and it is well worth a visit. There is a cafe near the top. Byron Bay is a popular beach destination. About a five minute drive to the south of town is Suffolk Park. This community is quieter and peaceful, but you'll still need to access many of the amenities in Byron Bay. Other nearby towns include Bangalow, Nimbin, Lennox Head, and Ballina. There are some interesting annual events and festivals in town. These include the East Coast Blues and Roots Music Festival, which takes place over Easter weekend, the Splendour in the Grass Music Festival in July, and Schoolies in November or December, which celebrates the end of the school year. It's better to avoid the crowds during Schoolies, as prices skyrocket and facilities become overrun. Don't make a trip to Byron Bay without participating in some of the great beach activities. Most popular are whale watching in September or October, surfing, diving, snorkeling, and of course, swimming. You'll find no shortage of activities here so come prepared to do more than lounge on the beach and soak up the sun. Seafood is plentiful around Byron Bay. Fish Mongers offers a high end version of fish and chips that is excellent. Another great seafood restaurant is Fisheads. Ethnic cuisine around town includes Thai, Indian, Italian, and even Mexican. Cafes that serve fresh food with good ingredients are abundant. There are also several good pizzerias around town. Byron Bay's closest airport is Ballina/Byron Airport. It's about a thirty minute drive from town. Gold Coast Airport is an hour away at Coolangatta. It's also possible to access the town by bus from Sydney or Brisbane. Both Greyhound and Premier buses make stops in town. There is no direct train service to town and the Byron Bay station has not been used since 2004. There are also many surfing or backpacker tours along the east coast that stop in Byron Bay. Having a car can be helpful in town as public transportation is limited. It is possible to walk to most destinations though. Blanch's Bus Company offers regular service to some areas as well. Do be prepared to sit in traffic as you arrive or leave this town, especially in the peak summer months. If traffic is particularly bad, consider coming into town by Ross Lane on the south side. If the tourist crowds get to be too much for you, the Suffolk Park area is a calmer alternative and is only a five minute drive away.